I love the colors and cables on this blanket! It is looking fabulous. I know what you mean about the temperatures I have been crocheting a granny style blanket and that too is lovely and warm on these chilly nights. We’ve got sunshine today but the wind is back! Where’s our summer? That blanket is so beautiful! I have been perusing your blog a bit and am excited to follow along with all your beautiful projects. Your blog is inspiring. Looking great and I wish it would warm up to 17 degrees here in the UK! I’m in the UK too, just north of you 🙂 I feel your pain LOL. Wow! You really have gotten quite a bit done. It is looking as beautiful as ever! I’d better get a move on! Thank you Carole. I’m having a lot of fun knitting it but I can’t hold a conversation at the same time LOL. Gorgeous, still! Going to start thinking about what yarn I would like to use to try your pattern out! How do you organize your WIPs I’m wondering? 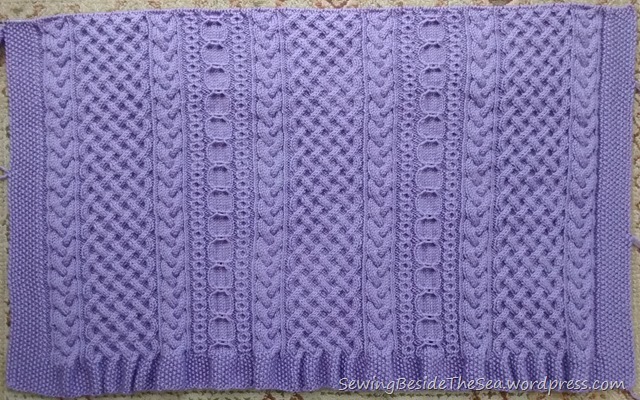 The variety of stitches and cables bring out the richness of the solid color! So very pretty! Thank you 🙂 The weather has changed dramatically and we now have Summer at last. The blanket is going on hold again. That is what has happened to my blanket. With temps in the high 90s and even a bit above 100°F and more humidity this year than usual, I have had to set it aside. I am back to smaller projects and cross stitching which also needs some time. Hopefully my right elbow will also appreciate the change of projects. And here I was enjoying the 70s last week. Oh well! Yes, I’m sure I jinxed our weather by shouting about it as well. You could join our SAL for your cross stitch (or whatever other project you choose) if you wish. Thank you for the invitation. I have actually considered asking about it, but haven’t made up my mind. I do love the inspiration all the different members provide and would like to return the “favor” so may ask to join sometime soon. Right now I’m catching up from vacation and so many things have been put on on hold for just a bit. Whenever you are ready 😃.